Going back to those early days, it’s strange to look back at how the service has evolved, and see features we now take for granted missing altogether or in a different form. For example, Twitter’s Retweet feature only arrived in November 2009 – before that you had to copy and paste the text of the tweet you wanted to share and manually type RT @username at the front. It was a cruel, savage world. Remember how, if you wanted to post a link to a website, you had to use bitly to shorten the URL manually, otherwise it risked using up your entire 140-character limit? Remember 140-character limits? Sure, Twitter now has 280 characters, but that's nothing compared to the thousands of characters in the books at your local library! To upload a picture, we had to use yfrog or TwitPic, because Twitter couldn’t do it itself. Annoyingly, yfrog has closed down, and taken its image archive with it, which means the context for this Tweet, among others, is lost forever. By way of “celebration”, I decided to take a peek into the dusty corners of my archive. 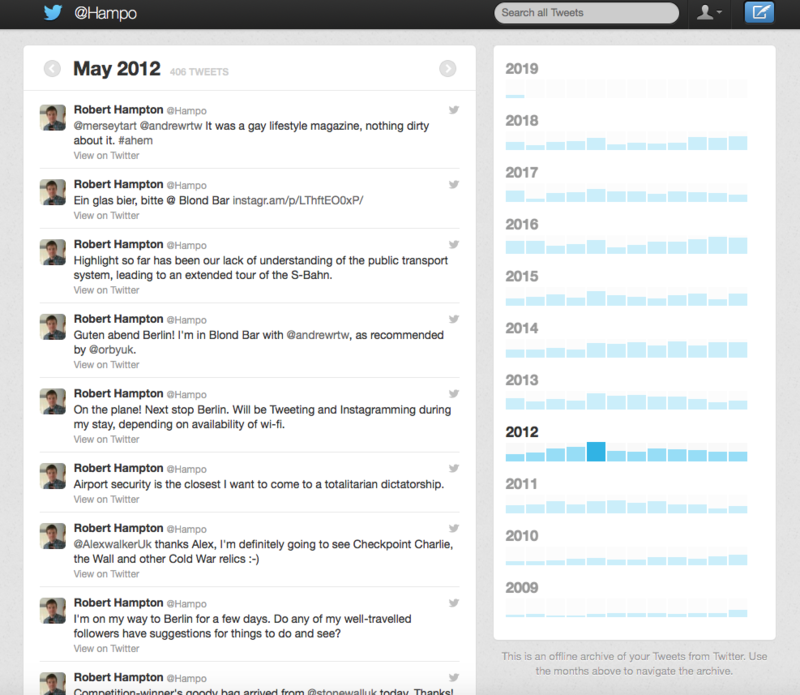 Twitter is designed to be an “in the moment” service, so delving into the past is not something often done. However, the site does offer the option to download your Tweet archive, a zip file containing everything you ever posted on the site, including retweets and @-replies. I was pleasantly surprised to see that rather than just being a dump of all your tweets, it is delivered as a fully interactive webpage, to the point of being fully searchable. Back in 2009 I didn’t yet have an iPhone, so tweeting only happened when sitting in front of my computer (or via SMS from my non-smart mobile phone). The technology moved on a bit, and by 2011 I was live-tweeting The Apprentice from a Windows XP netbook. Yes, I spammed people’s feeds with that nonsense early on. It’s disconcerting to see some things I tweeted in the past which I am a bit uncomfortable with now. Unlike some people, I have never tried to carefully cultivate a Twitter “brand”, but I see some things that I can’t believe I tweeted, such as a very regrettable sneery reference to chavs, having a needless jab at Harriet Harman, or slagging off Bootle. I’d like to think I’m a bit more enlightened these days, and if nothing else, remember the golden rule: always punch up. One great thing about Twitter is that stuff which perhaps seemed mundane at the time but seem more significant in retrospect. In my archives there are offhand mentions of shiny new things like Windows 7, the iPad, contactless card payments. As always, my analysis of the emerging technology was spot on. I am in love with Berlin. Not sure if it's a lasting love, but at the very least I'd like to stay with Liverpool and see Berlin on the side. More recently, things have become a bit less cheerful. First there was the dreadful shock of the 2015 Election, but even worse was to come a year later. In both cases, Twitter became an outlet for my grief, but it eventually became too much. In 2015, after the election result, I had to log off temporarily (and delete the app from my phone) because the stream of bad news became overwhelming. There’s no doubt that the site can be very bad for your mental health, if you’re not careful. Twitter pretty much killed my old blog. I admitted at the time, “I get more enjoyment out of crafting 140-character Tweets these days,” and I think that’s still true. Why slave over a blog post which no-one reads or comments on, when you can post a pithy remark, get a dopamine high from the six likes it gets, and still have time to binge-watch She-Ra on Netflix? More importantly, Twitter helped me deal with my sexuality. Ten years ago, I was out to almost no-one. On Twitter, I was able to follow LGBT people and organisations, realise that I was not alone, and test the water by dropping in the occasional reference to my sexual orientation. There are lots of problems with Twitter. Women and other minorities face daily abuse, misogyny and threats. It is far too easy to whip up an online hate-mob. The site has become a breeding-ground for right-wing extremists. Bots are manipulating the online conversation. Scarily, nobody in charge at Twitter seems to be doing anything about it, preferring to mess around with the site’s user interface (seriously, we JUST WANT THE TWEETS IN CHRONOLOGICAL ORDER). I am fortunate to not be exposed to much of the dark side. I appreciate that I am extremely privileged to be in that position. I am extremely careful about who I follow. If someone I follow posts something obnoxious or offensive to me, I unfollow and move on – I don’t want to see that coming unbidden onto my screen. Maybe you could accuse me of living in an echo chamber, but I think life’s too short to spend it being angry online. These days I’m careful what I say, trying to avoid provoking anyone. Is that self-censorship? Probably, but again, life’s too short to argue with random people on the internet. For me, the negatives still (just about) outweigh the positives. I have made genuine friends through the site, including Scyrene, metro_land, mrphilliptipton and rincew1nd. There’s loads more people whom I would like to meet up with in person, were it not for distance or other considerations. But that’s one of the great things about this site, you can contact and stay in touch with people all over the world, and get a window into their lives, be they banal or extraordinary. My rule on Twitter, which has served me well, is to only follow people whom I would like to meet in real life for a coffee. For all its faults, Twitter remains the best place to get up to the minute commentary on live events, take the piss out of Eurovision and find out which faded comedy writers are actually terrible people. And hey, at least it isn’t Facebook. and you wouldn’t be the same without it.